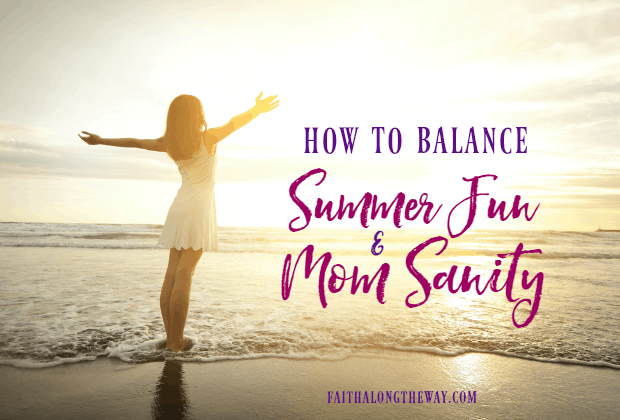 Summer is a blissful time for children, yet can be a struggle for moms. The balance of planning memorable activities for the kids and yearning for a stolen moment alone is battle many moms face this season. I completely relate, friend, do you? 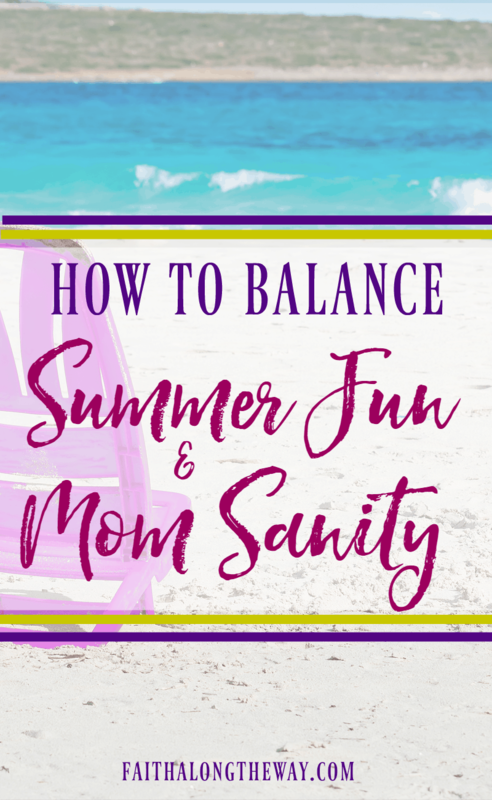 Do you wonder how to balance summer fun expectations and real life? Are you longing to make memories with your children but not cater to every whim and demand? Whether you’re ecstatic summer is here or your praying deep for patience, implementing these few boundaries will help this short season run more smoothly. Last summer was a great one for us, simply because I left go of lofty expectations. Being flexible and realistic has freed me to relax and make memories. Plus, it’s given my children a chance to grow and become independent. While we will have a loose plan each day, if I see something is not working for us, I will change direction immediately. While this may sound fancy and unnecessary, having a sentence or two to ground what you hope to “accomplish” this summer with your kids will be a blessing. Personally, I want to teach my kids more about God’s Word, how to expand their prayer life, and to just have fun. Having a mission statement will help a family be more intentional about how time together is spent. Grab this free printable, write out your mission statement, and hang it in place of prominence to remind yourself of your goal. I long to be the happy and joyful mom who radiates the love of the Lord. But sometimes I’m the grouchy, tired mom who would love a nap and to curl up with a good book. Finding balance in your own life leads to a pleasant attitude, which will bless your entire family and change the course of your summer. For me, this means getting up early, diving into God’s Word, and talking with Him in prayer. Knowing where that God supplies my strength keeps me peaceful in moments of stress and starts my day with a happy heart. The Women’s Bible Study Templates are making my Bible study practical and simple. It’s helping me streamline my devotional time, which is perfect for the times the kids are home. I love to say yes to my kids, but that’s not reality all the time! I’m setting careful boundaries this summer and will not be afraid to say no to the grand plans they dream up. Mama, don’t be afraid to say no when they want to be entertained all the time. This allows kids the chance to be creative and to blossom into who God created them to be. Character growth and development happens when parents put boundaries and limitations. It may not be popular with the kids, but you don’t “owe” them constant entertainment! When I’m on Facebook browsing through my news feed, I’m bombarded with pictures of grand vacations and expensive activities. But that’s not our life at all. Thank God for the blessings He’s given you and the family He’s blessed you with. If spending the summer unplugged helps you live content, then I encourage you to do so. Are you looking for ways to entertain the kids and have fun with them this summer? Register above to have instant access to the FREE e-book/planner, Mom’s Summer Survival Guide. Love this! These are great ideas! Thanks for the printable! I’m glad to help make summer easier! I love the idea of a mission statement. I created a list of activities for us to do each week and I just check them off as we get through them. It’s very relaxed, easy going, but keeps the kids on the go. What a fabulous idea to make a list and check off as you go. It takes the pressure off of remembering! Yes, the don’t compare one is huge for me. I always seem to struggle with this, esp when my friends are going to Hawaii or taking a Disney vacation. Thanks for the encouraging words. I’m the same way! I’ve been trying to limit my time on FB for that very reason. I want to soak in my blessings, not be jealous of someone else. 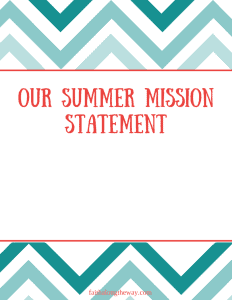 I love the idea of creating a family mission statement for the summer! I’m a bit worried about balancing blogging and family time. I think this will help all of us. I understand, Barb! It’s already been a challenge for me and I always feel as though I not doing anything well. 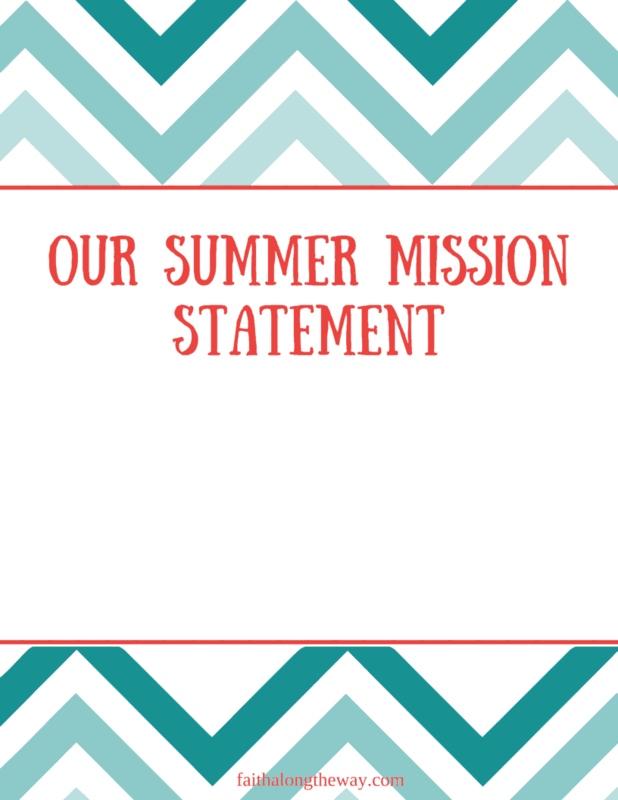 A summer mission statement has helped me refocus and re-shift my priorities! I’m taking this post to heart this summer! The good news is that my husband will be working from home and since we both have flexible schedules, we are not forced to stay indoors for a large section of the season. Taking the girls to local events are going to help but I’ve already set some learning goals (creating a garden bed, teaching the kids to cook) to help space out the long times they have. We’ve already had play date requests so that is good! Thanks, these are great ideas. How fun to have your hubby at home for the summer! It sounds like you have some great ideas and are well prepared. I think that’s half the battle! Coupon Gal (Andi) recently posted…Giving God Glory, Honor, And Praise This Week! Me, too! I am such a work in progress! Yay! I love the #ETHANproject and hope you are enjoying the journey of it! Have fun! I really need to work on being more flexible. My kids are 3 and 4 and I have a hard time when it takes 20 minutes to put on their sandals or when it’s time for a nap but they want to read 6 books first. I need to be more flexible and give them and myself more time this summer! Thanks for these tips! You are not alone, Amber! That is my goal too! Please stop by and let me know how it’s going for you!